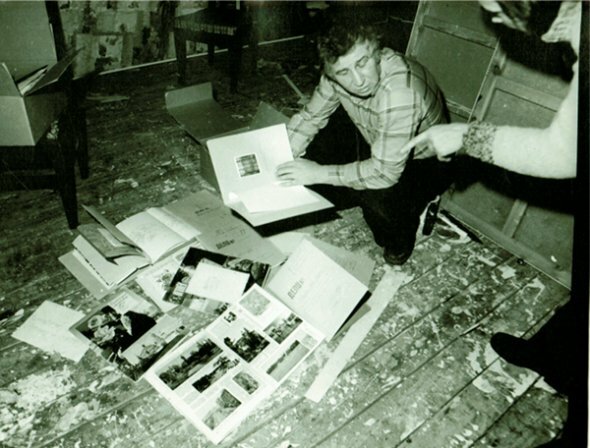 Costakis surrounded by works from his collection, 1971. Photo: Igor Palmin (courtesy of Igor Palmin). Otari Kandaurov painting the portrait of Costakis, with daughter Katya, Moscow, 1970. Photo: Igor Palmin (courtesy Igor Palmin). Costakis with the American sculptor George Segal, Moscow, 1977. Photo: Igor Palmin (courtesy of Igor Palmin). 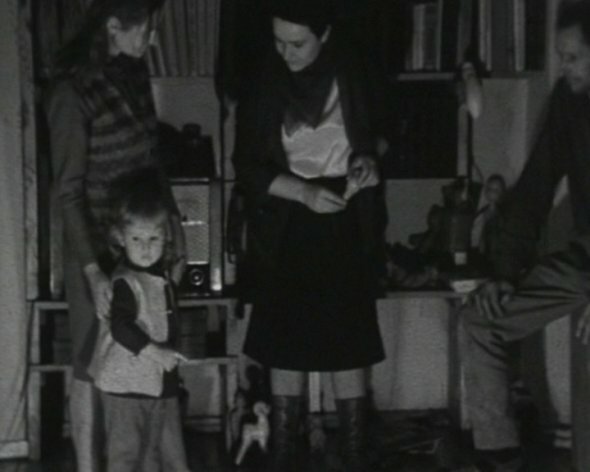 Art historian Margarita Tupitsyn, Costakis, and artist Lydia Masterkov at the birthday party of artist Genrikh Khudyakov, 1971. Photo: Igor Palmin (courtesy of Igor Palmin). 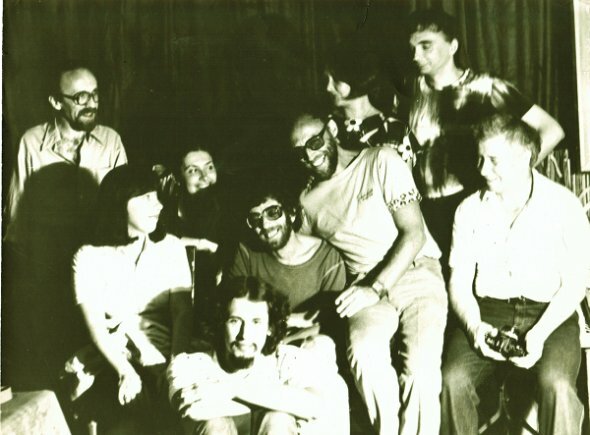 Artists at the farewell party for Costakis, 19 March 1977. Photo: Igor Palmin (courtesy of Igor Palmin). George Costakis (Georgii Dionisovich Kostaki, 1912-1990) began collecting Russian avant-garde art in 1946, when he discovered three paintings by Olga Rozanova in a Moscow studio, and was bitten by the collecting bug. He soon added 15th-17th century Russian icons and the work of young “nonconformist” artists, like Anatoly Zverev and Dmitri Krasnopevtsev, to his roster. 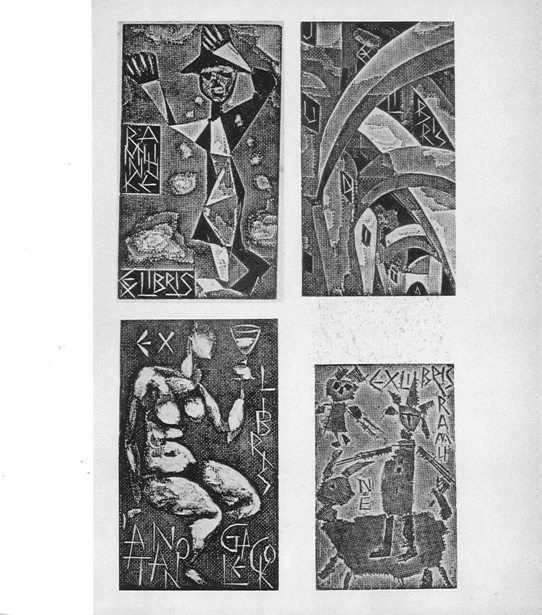 Employed at the Canadian embassy as an administrative clerk, Costakis hunted for lost works by such artists as Vasily Kandinsky, Kazimir Malevich, Lyubov Popova, Aleksandr Rodchenko, Ivan Puni, and Ivan Kliun anywhere he could find them, among remaining relatives and tucked away in private rooms and studios around the Soviet Union. At a time when modernist art was hidden from view in the storerooms of Soviet museums, Costakis’s private collection, which he displayed on the walls of his home, became Moscow’s unofficial museum of modern art and a meeting place for international art collectors and art lovers visiting the capital. Regular guests to Costakis’s apartment included nonconformist artists Anatoly Zverev (1931-1986), Oskar Rabin (b. 1928), Dmitri Krasnopevtsev (1924-1995), Dmitri Plavinsky (1937-2012), Vladimir Veisberg (1924-1985), and many others. 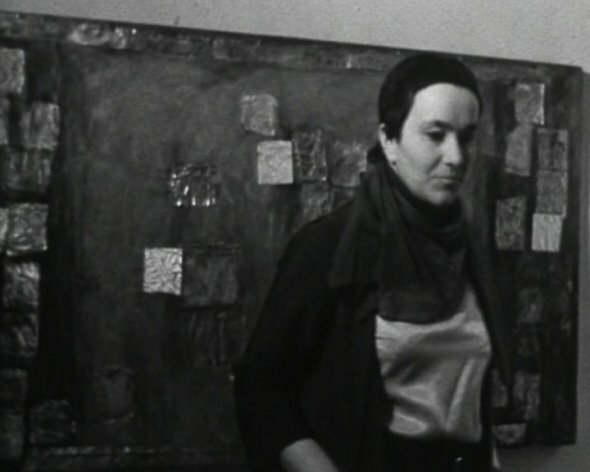 Costakis’s friendship with the younger artists gave them access to the avant-garde legacy, to which many of their own works aspired and responded. Costakis left the Soviet Union for Greece in 1977, leaving a large portion of his collection as a gift to the Russian people to reside at the State Tretyakov Gallery. Fly-leaf from Igor Palmin’s handmade photo album documenting the festival. Photos: Igor Palmin (courtesy of Igor Palmin). Opening at Luzhniki Stadium. Captions: (top) the guests liked Moscow’s ice-cream from the first day; (bottom) the Norwegians are easy to spot by their knit caps. Photos: Igor Palmin (courtesy of Igor Palmin). Muscial concert at the Central House of Workers in the Arts (TsDRI). Captions (clockwise from left): American folk singers Peggy Seeger and Guy Carawan; Jeff Ellison presenting his quintet; J.E. and his jazz band. Photos: Igor Palmin (courtesy of Igor Palmin). Public discussing artworks on view in the Italian Hall of the Exhibition of Paintings, Gorky Park. Photo: Igor Palmin (courtesy of Igor Palmin). The sixth World Festival of Youth and Students took place over two weeks in the summer of 1957, bringing over 30,000 foreign guests to the Soviet capital with the stated goal of promoting peace and friendship. 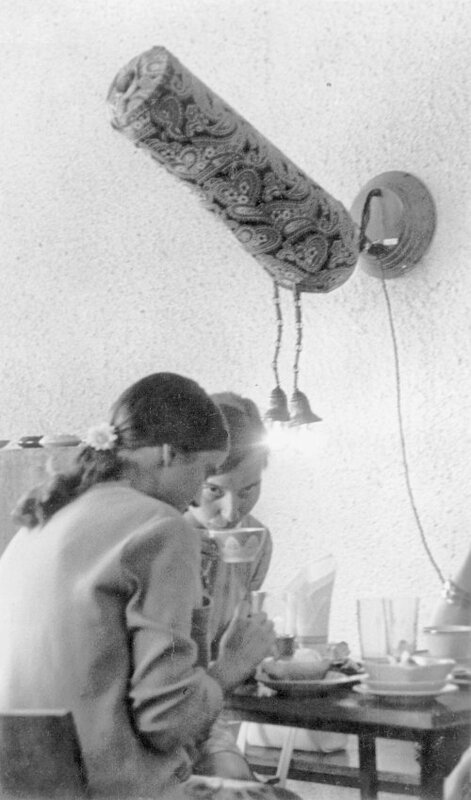 After the isolation of the Stalin years, the Festival played a major role in opening up Soviet society to the West, as Soviet visitors encountered Western consumer goods, jazz music, and modernist art for the first time, and mingled with guests from abroad. For many young artists, the painting exhibitions, coming on the heels of the hugely successful Picasso retrospective at the Pushkin Museum the previous year, were a revelation. 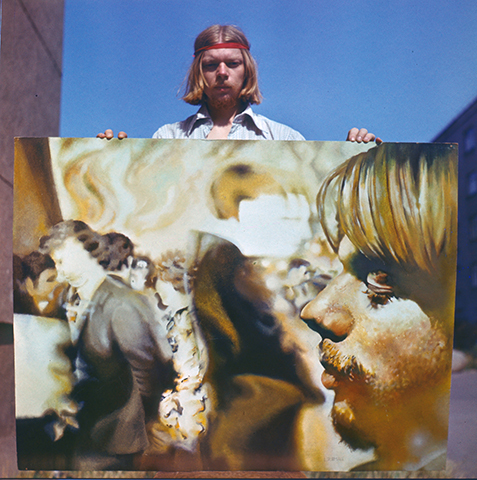 Many unofficial and nonconformist artists of the 1960s generation attribute their later bold explorations of modernist idioms to this formative experience. The photographs presented here were shot by Igor Palmin, a recently-graduated geology student at the time, who had obtained a coveted ticket to the opening festivities at Luzhniki Stadium. He managed to document many of the Festival’s delegations and crowded cultural events, assembling the shots into a handmade annotated album, from which these pages are taken. 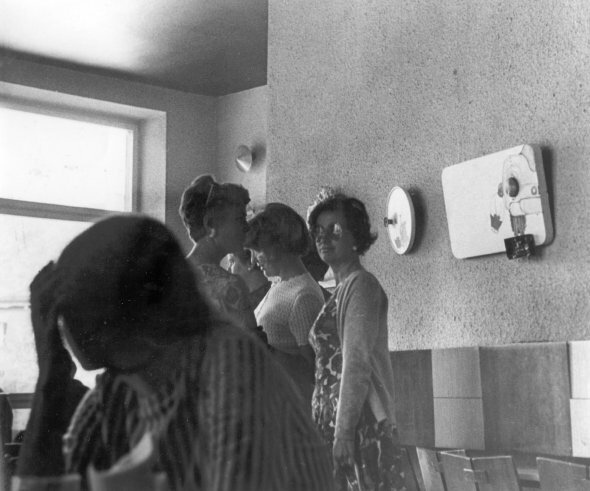 In the following decades, Palmin would become one of the most prolific documentarians of the Soviet artistic underground as well as a distinguished photographer for such publications as Iskusstvo, Sovetskii khudozhnik, and Sovetskii pisatel. His portraits of unofficial artists in their studios and candid shots of special gatherings convey something of the warmth of underground social life in the last decades of the Soviet Union. 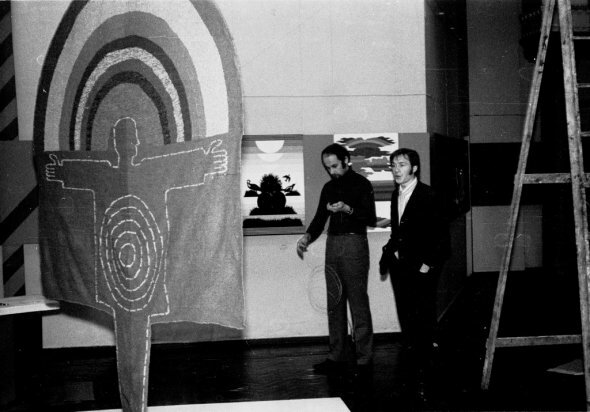 Linas Katinas’s painting exhibition in the sports hall of the Urban Planning Institute, Vilnius, 1974. Photo: Linas Katinas (courtesy of Linas Katinas). 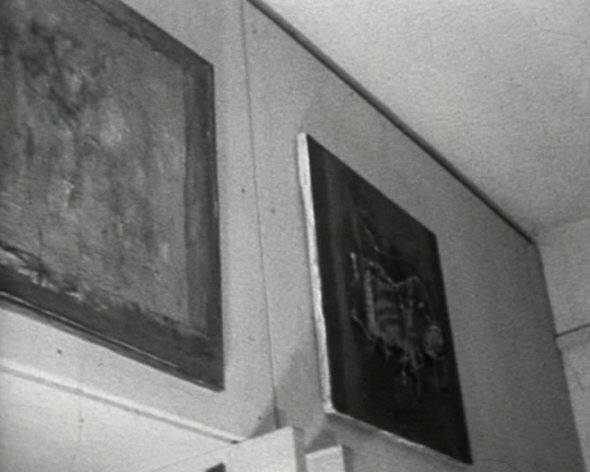 Kazimiera (Kazė) Zimblytė’s painting exhibition at the Vaga Publishing House, Vilnius, 1968. Photo: Dainora Juchnevičiūtė (courtesy of Dainora Juchnevičiūtė). 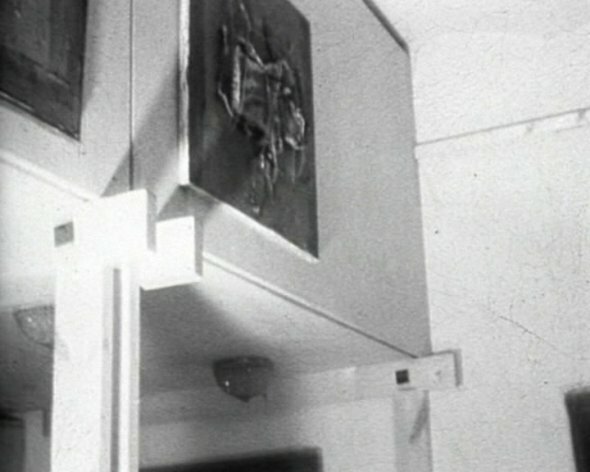 In the period the art historian Elona Lubytė termed ‘silent modernism’ (1962–1982), unofficial exhibitions were held not only in artists’ studios or residences, but also in various non-art institutions that were home to patrons of modern art and exhibition-initiators. Among the most significant institutions were the club of the LSSR (Lithuanian Soviet Socialist Republic) Writers’ Union, the LSSR State Conservatory, the Urban Planning Institute, the Vaga publishing house (all based in Vilnius), and the Panevėžys Drama Theater, led by the acclaimed director Juozas Miltinis, who cultivated avant-garde ideas in his stage productions. According to contemporaries, the control of the art events that took place inside these institutions was less strict, yet these exhibitions were not advertised by official posters or covered by the press; in other words, they did not receive public attention or official evaluation. Artists’ works were exhibited in lobbies, hallways, offices, and sports and concert halls. Sometimes the unusual exhibition spaces spawned alternative approaches to displaying works of art. 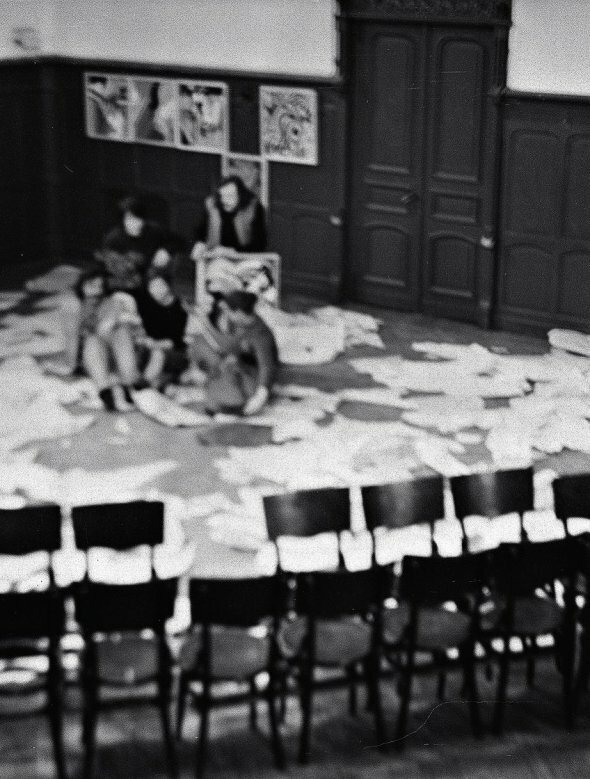 Installation view at the Fluxus concert. Photo: Vytautas Landsbergis (courtesy of Vytautas Landsbergis). 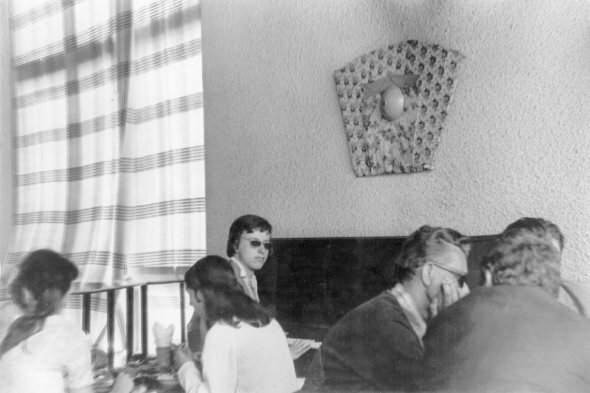 In the 1960s, the musicologist Vytautas Landsbergis corresponded with his childhood friend, artist and initiator of the Fluxus movement George Maciunas. Maciunas laid out the ideas of this anti-art movement in his letters, and sent Landsbergis recordings of his favorite music and Fluxus performances, as well as Fluxus scores. Landsbergis used this material in his public lectures on modern music. 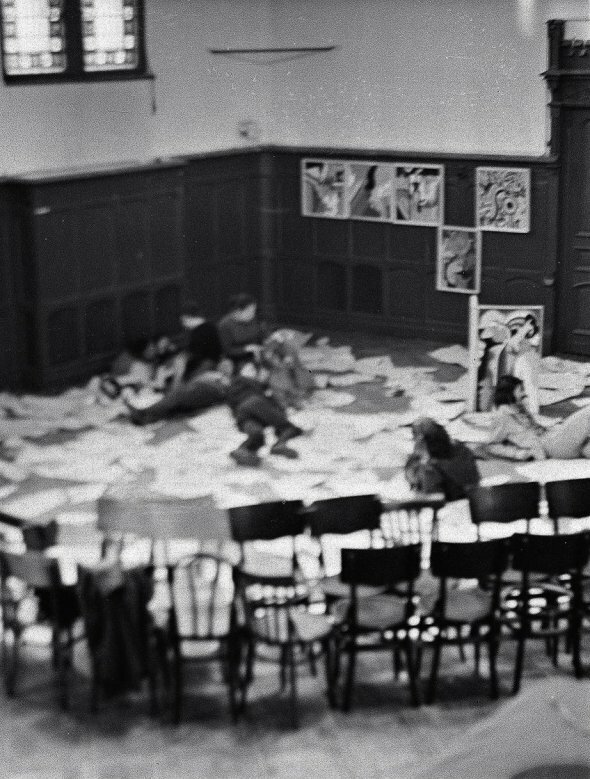 In 1966, Landsbergis organized a Fluxus concert at the Vilnius Pedagogical Institute, where he taught at the time, together with the institute’s senior students (around 20). The event started with the New Music manifesto written and read by Landsbergis. The program of the concert that lasted for approximately 30 min. 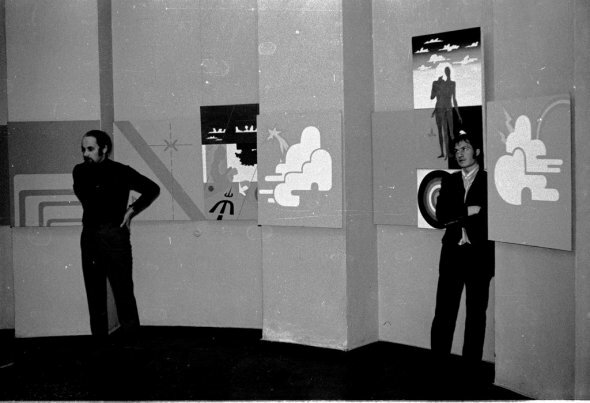 was comprised of the instructions sent by Maciunas, complemented with Landsbergis’s own ideas; Landsbergis also created the wall decorations that reflected the Fluxus spirit and set the atmosphere for the concert. 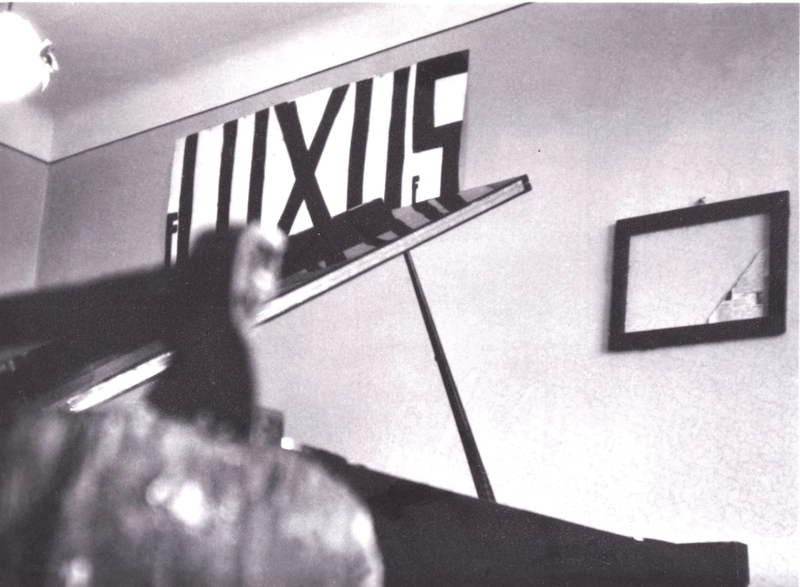 Although this avant-garde movement did not take on in Lithuania (the mentioned concert remains the only notable Fluxus event), the dissemination of the ideas of Fluxus and modern music via Landsbergis’s lectures contributed to the emergence and spread of modern art forms. 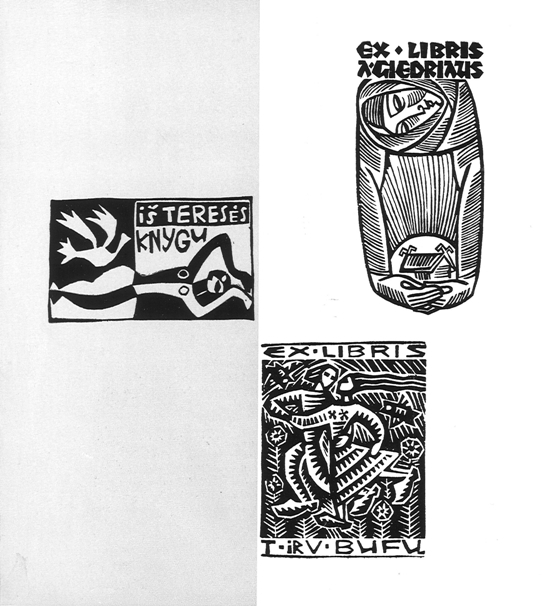 Ex libris by Kastytis Juodikaitis. Digital scan copy from the catalogue “3rd International Biennial Exhibition of Modern Ex libris”, Muzeum Zamkowe, Malbork, Poland, 1967. Ex libris by Vincas Kisarauskas. 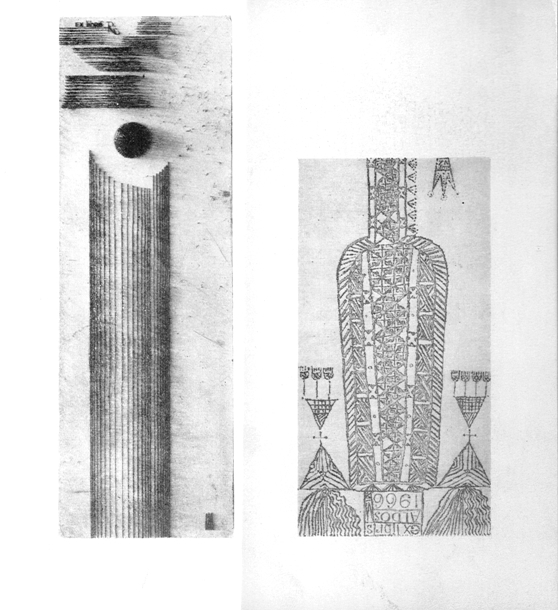 Digital scan copy from the catalogue “3rd International Biennial Exhibition of Modern Ex libris”, Muzeum Zamkowe, Malbork, Poland, 1967. Ex libris by Antanas Kmieliauskas. Digital scan copy from the catalogue “3rd International Biennial Exhibition of Modern Ex libris”, Muzeum Zamkowe, Malbork, Poland, 1967. Ex libris by Vladas Žilius. Digital scan copy from the catalogue “3rd International Biennial Exhibition of Modern Ex libris”, Muzeum Zamkowe, Malbork, Poland, 1967. Laurynas Liberis, Ex libris by Lithuanian Artists in International Exhibitions via Mail, 1967–1985, 2011. The phenomenon of artistic communication via mail emerged in Lithuania as a form of resistance to the ideologisation and isolation of art. 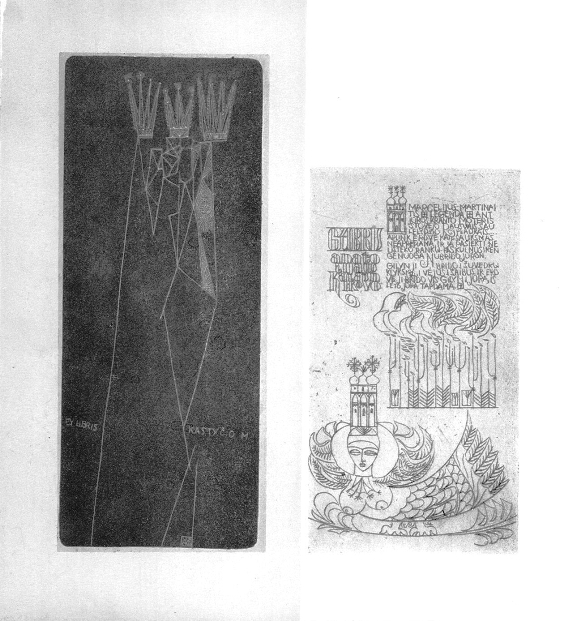 In the late 1960s, Lithuanian artists became interested in a small form of graphic art – exlibris (bookplate). Such small forms were seen as marginal at the time, yet it was precisely this status that helped them to circumvent strict Soviet censorship and secure a special place among other art forms in the context of Soviet art. 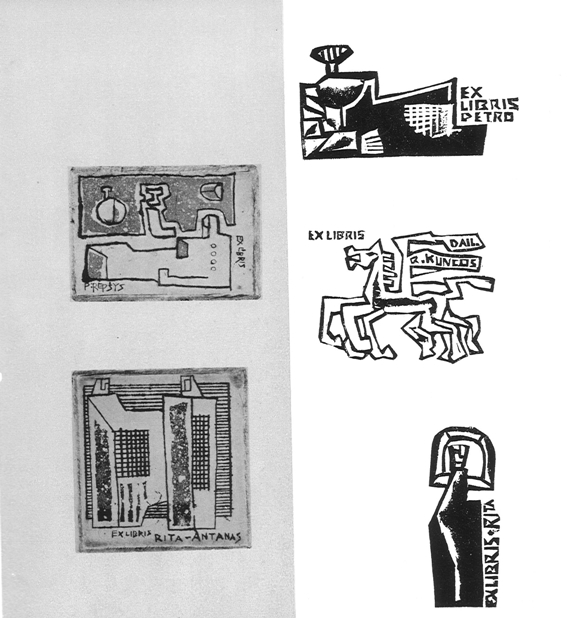 Exlibris was a mobile genre that could represent Lithuanian modern art abroad, as small-format bookplates could be sent to international exhibitions without the knowledge of the state institutions. In addition to the graphic artists, the sculptors and the painters began to work in the genre of exlibris too: about 200 Lithuanian artists engaged in communication via mail in the Soviet times. Thanks to the connections of the artist Vincas Kisarauskas, four Lithuanian artists took part in an international exhibition abroad – the International Biennial Exhibition of Modern Exlibris in Malbork – for the first time in 1967. As the circle of foreign contacts expanded, artists sent their bookplates to exhibitions in Poland, Italy, Denmark, the USA, Australia, and elsewhere. The genre of exlibris and communication via mail provided Lithuanian artists with a possibility to present their work on the international level and receive due acclaim for it. 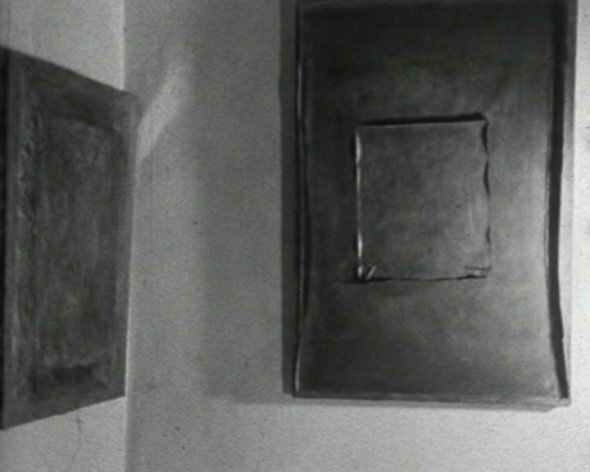 Still from the film For Those Who Do Not Know, Ask Those Who Do, 1975, 5 min. 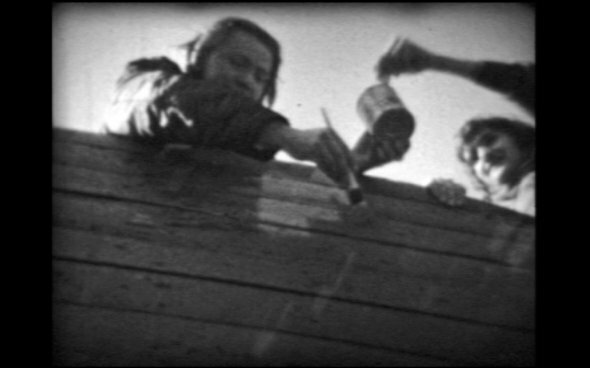 Director: Artūras Barysas-Baras; cinematography: Jonas Čergelis, Stasys Mackonis, and Albinas Slavinskas (courtesy of Artūras Barysas-Baras’ family). 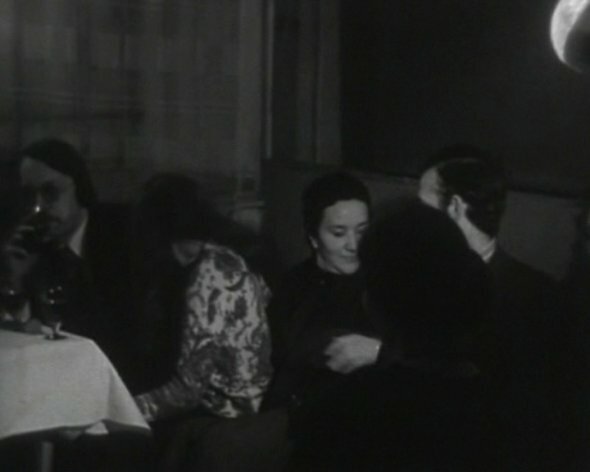 Still from the film That Sweet Word …, 1977, 1 min. 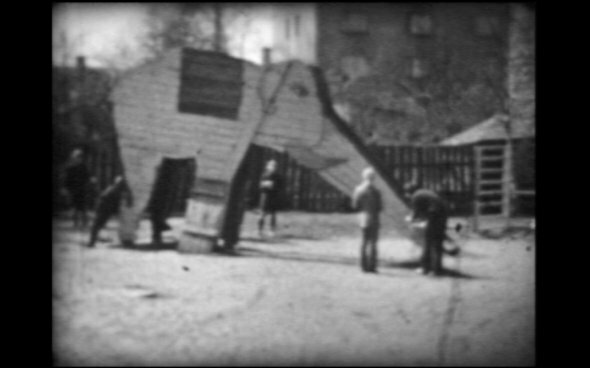 Director: Artūras Barysas-Baras; cinematography: Dominykas Velička (courtesy of Artūras Barysas-Baras’ family). 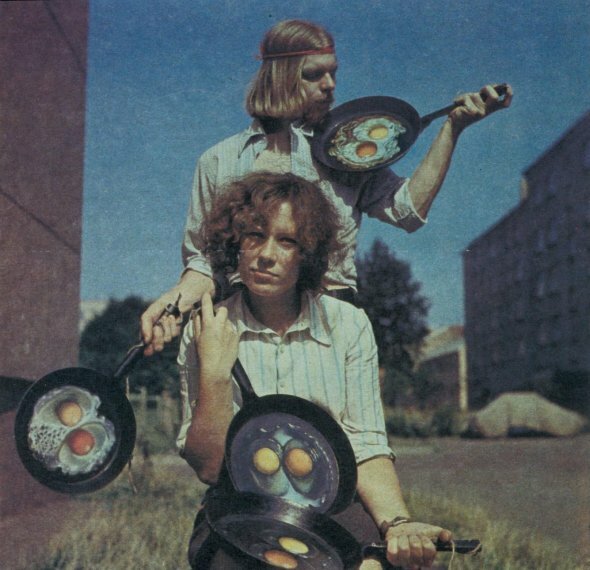 Artūras Barysas-Baras (1954–2005) – filmmaker, actor, record collector, and bibliophile – was one of the most prominent personalities in Vilnius’ alternative culture of the second half of the 20th century. He had become a member of the LSSR Society of Amateur Filmmakers in his school years, and made more than 30 short films during his lifetime, most of them between 1970 and 1984 (11 of the films have been lost). Barysas’ films earned critical acclaim at republican and Union-wide amateur film festivals. The amateur film festivals, presenting films under various categories, were popular events in all Soviet Union, as well as in other socialistic countries. Though subsidized by the state, the amateur cinema (an unprofessional art form), was left almost entirely outside the interference and control of Soviet authorities and was a medium conducive for experimenting. Film festivals presented Artūras Barysas and his films to audiences in Moscow, Leningrad, Tula, Tallinn, Riga, Brest, and Bryansk. 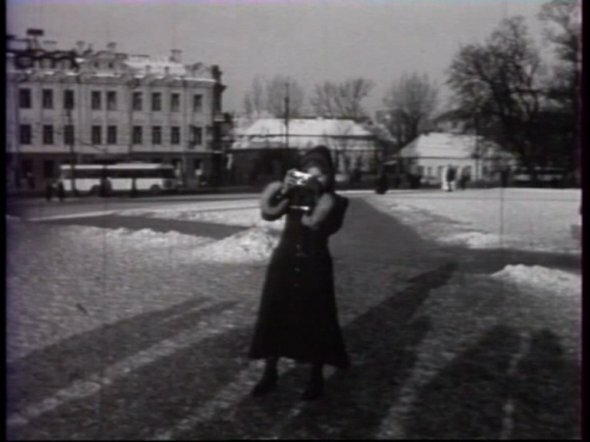 Braysas’ films were prized for their metaphorical artistic language, which implicitly mocked the everyday reality of life in the Soviet Union, and peculiar close-up montages. Barysas played the lead role in almost all of his films, supported by non-professional actors, with the action often taking place simply “on the street” as an improvised situations or according to a conventional scenario. 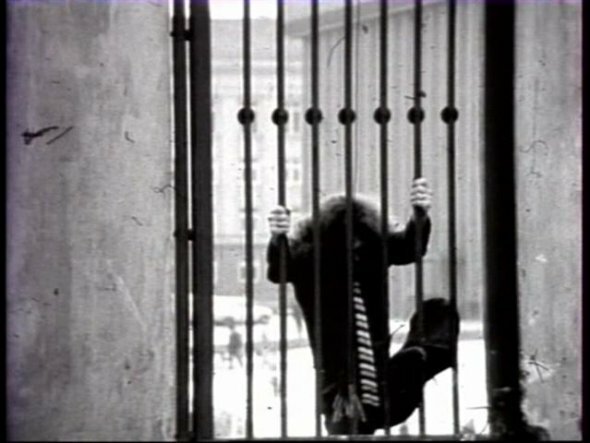 In Barysas’s films, the film critic Skirmantas Valiulis traces echoes of American postwar avant-garde filmmaker Maya Deren’s theoretical statements about filmmaking, the comic aesthetic of pre-1968 Czech cinema, and Felliniesque humor, yet acknowledges that the Lithuanian filmmaker retains a peculiar style of his own. 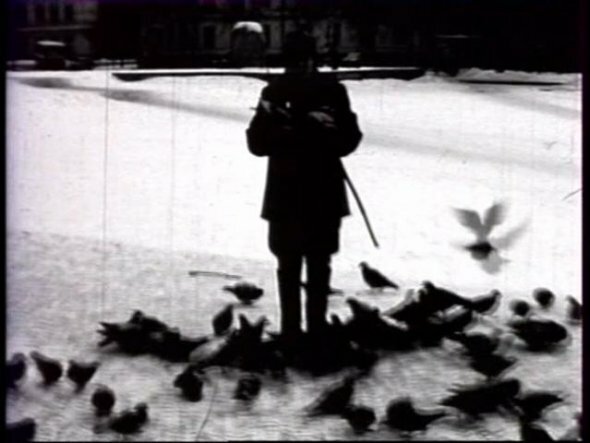 Today Barysas’ work is considered to be a part of the Lithuanian cinematic avant-garde and an eloquent reflection of the epoch. 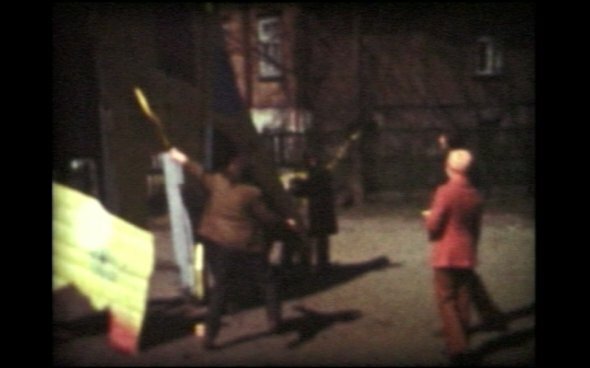 In the context of the visual arts, some of Barysas’ films invite a discussion impossible without the concepts of performance and happening, especially two of them: That Sweet Word… (1977) and For Those Who Do Not Know, Ask Those Who Do (1975). Both of them were presented at the Republican (LSSR) Humorous-Satirical Film Festival (respectively in 1977 and 1979) for the first time, and later on That Sweet Word…, awarded with the 3rd-degree “cheese-sack”, was screened in three film festivals under different film categories, such as 9th Film Festival of Baltic States and Leningrad City, Leningrad, 1977; 9th Short-Film Competition in Riga, 1977, and 19th B-16 Festival in Brno, Czechoslovakia, 1978. Skirmantas Valiulis, “Baras kino baruose” [Baras in the Domains of Cinema], in Pasaulis pagal Barą [The World According to Baras), ed. Gediminas Kajėnas (to be published in 2012). The book is focused on Artūras Barysas-Baras’ personality and creative work. (courtesy of Artūras Barysas-Baras’ family). 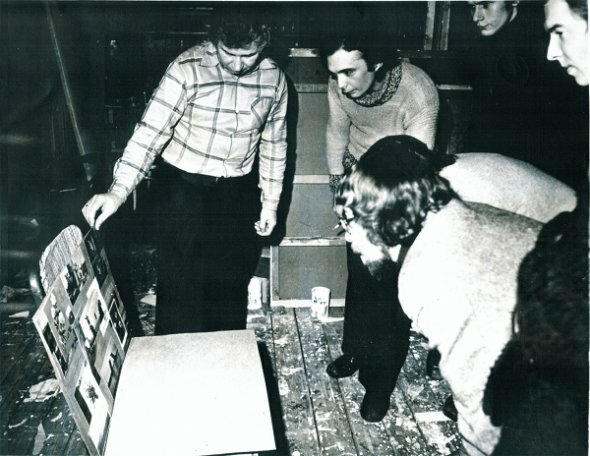 The group exhibition being set up by its organizers — Laimonis Šēnbergs, Henrihs Vorkals, and Arvīds Priedīte. Photo: Atis Ieviņš. 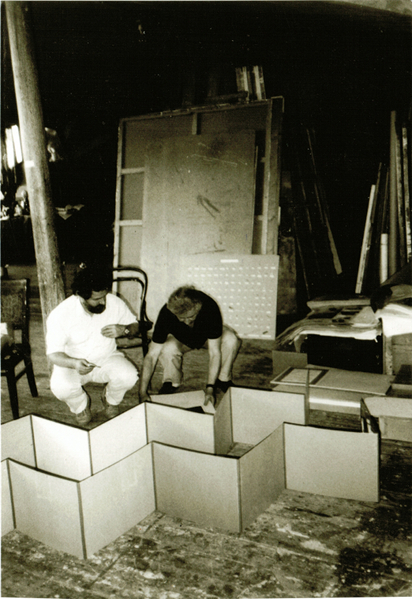 The group exhibition being set up by its organizers — Laimonis Šēnbergs and Henrihs Vorkals. Photo: Atis Ieviņš. Participants: Jānis Borgs, Atis Ieviņš, Laimonis Šēnbergs, Arvīds Priedīte, and Henrihs Vorkals. Location: Republican House of Science, Riga. This exhibition was the first visible event in Riga in which direct Western influences and the linking of art to a sense of real time were manifested. Participants were a group of like-minded artists studying design, interior design, and textile arts at the Art Academy. 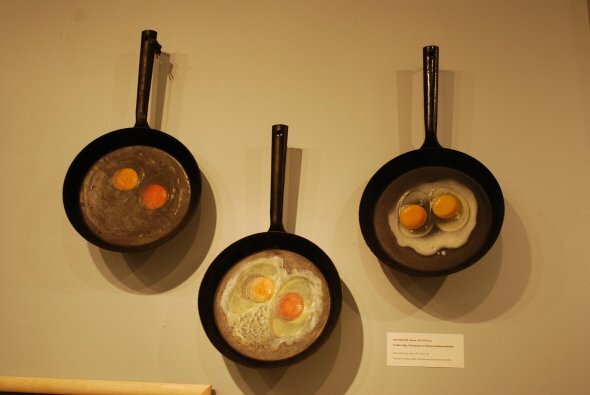 The exhibition had an innovative, experimental arrangement. The central object was Henrihs Vorkals’s spatial tapestry Icarus, in which colorful circles and crescents united a human figure’s inner and outer worlds, allowing it to be interpreted as a target, victim, or struggle. The exhibition’s second strong accent was Jānis Borgs’s super-graphic in which the cartoonish label “Sviuuu …” was placed over an abstract geometric base. This was complemented by similar silk screens, sketches, paintings, and posters scattered around the perimeter of the circular hall. Location: Exhibition hall of the Institute of Scientific Technical Information and Propaganda (the historic Stock Exchange), Riga. Participants: Exhibition installer and chief artist: Jānis Pipurs. 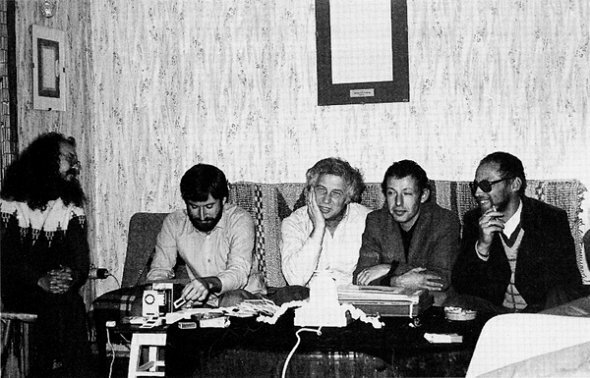 Creative team: Jānis Borgs, Nora Ķivule, Jānis Osis, Leo Preiss, Laimonis Šēnbergs, and Viesturs Vilks. Altogether forty-nine artists took part. The ninth Young Artists’ Exhibition was devoted to the fiftieth anniversary of the foundation of the USSR and presented a wide-ranging program. An exhibition of paintings, graphics, and sculptures was held in the Foreign Art Museum, while the Stock Exchange hosted the experimental collective interior design exhibition “Celebrations.” This latter event was one of most capacious presentations of contemporary art, which demonstrated that the avant-garde was not based just in alternative circles, but, through peculiarities of the Soviet system, it was also part of the official, politically acceptable process. The exhibition’s title was open to various interpretations, and its formal alignment with the anniversary of the USSR, as well as its designation in the design category, made it possible to present a broad, atypically Soviet range of works, with much less painting and sculpture. 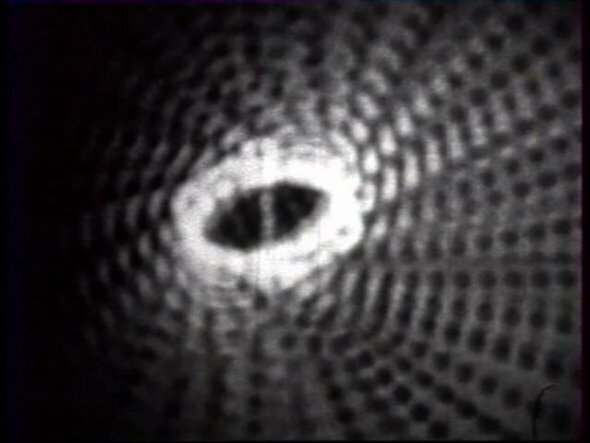 It was “a dynamic exhibition-show and improvisation in which everything pulsed, moved, glittered, beeped, or revealed other dynamic-kinetic expressions.” Viewers were surprised by the moving floor that beeped when walked upon, the “thirsty” silver fishes that moved in the air against the background of a sunny Pop-art painting, rotating cylinders and towers, etc. The exhibition emphasized formal and aesthetic solutions, but it also paved the way for the hybrid and art-synthesis processes of the 1970s. Involving spatial, architectural, urban-planning, psychological, and other elements, it changed the way of art perception and the role of the audience. An interview with J. Borgs in April, 2009. The opening. Photo: Māra Brašmane. 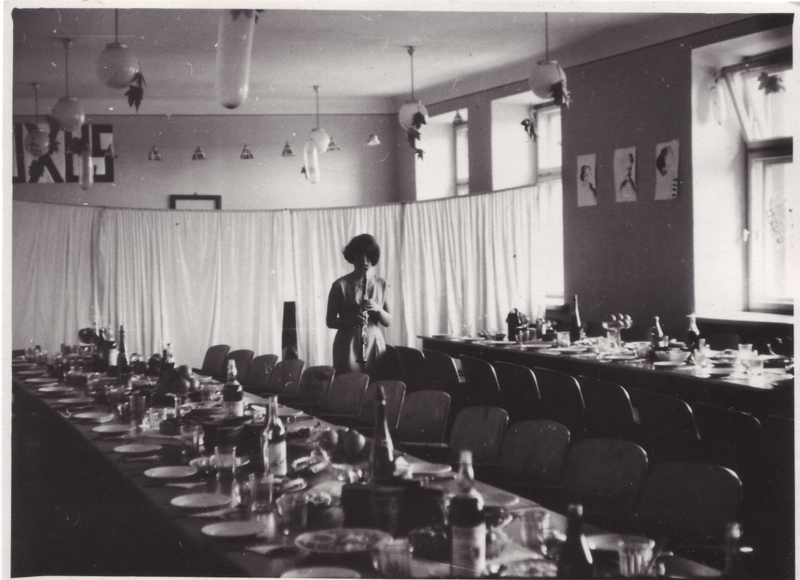 There were a series of exhibitions organized by students themselves through the student club and the Communist Youth Committee, but entry to them was restricted to students and staff of the academy. The official justification for the events was the need for the academy’s faculty to be informed about the extracurricular explorations of their students. 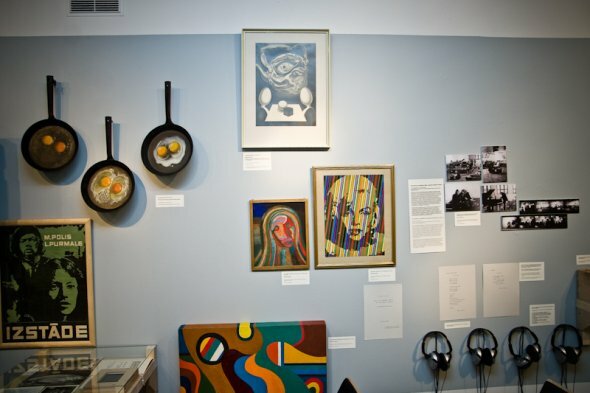 The students produced a number of freethinking events that broke artistic taboos and caused controversy, scandal, and the closure of several exhibitions. These exhibitions were not controlled by any approval (censorship) committee and did not respect thematic or ideological boundaries, and hence works with eccentric styles and content could be displayed. 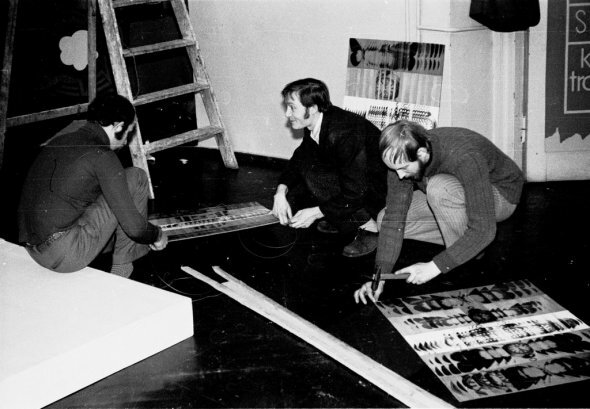 For example, in 1972 three students from the painting and sculpture departments—Romualds Geikins, Jānis Strupulis, and Piotr Severin—organized an exhibition/action with abstract, Op-art and Pop-art works arranged in an unusual set-up. Some of the works were displayed on the floor, which was strewn with papers, while elements such as chairs and easels were stacked in installation-like piles, disturbing the space. The exhibition was banned the next day, deemed artistically unsuitable and to be propagating politically dissident notions. Several other exhibitions of independent works were also shut down in a similar manner. Poster for the exhibition. 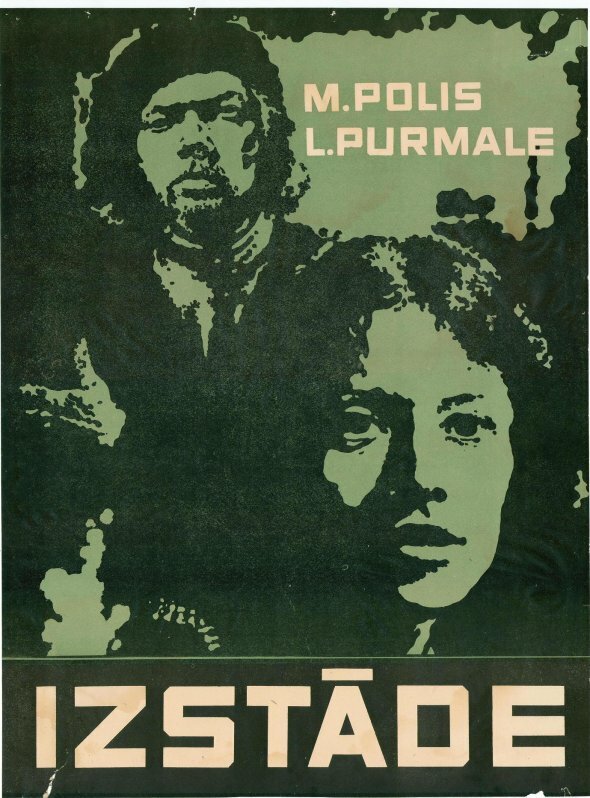 The poster was created by Polis himself redrawing Purmale’s painting Double Portrait (1973). Miervaldis Polis’ painting Automobile House. 1973. Miervaldis Polis: Brass Band, 1974. 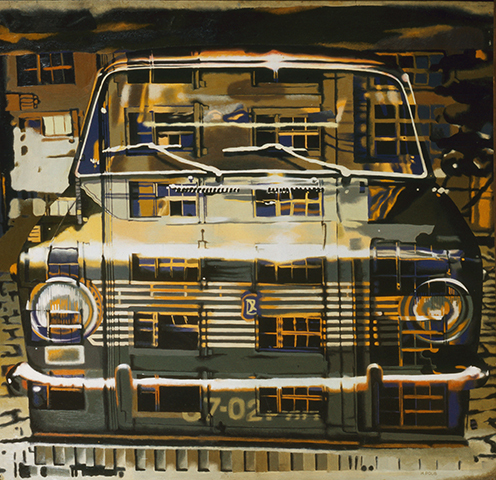 This exhibition of photorealist works by fourth year Art Academy students Miervaldis Polis and Līga Purmale was the first serious manifestation of its kind not just in Soviet Latvia, but also in the wider region. It was unprecedented for students to organize an exhibition on their own initiative open to all outside the academy. To make it happen, the artists had to collect recommendations and permits from almost ten different institutions. The artists vividly recall an episode in which members of the Central Committee suddenly turned up at the exhibition, apparently on the basis of an anonymous report that one of the paintings made a mockery of Lenin. 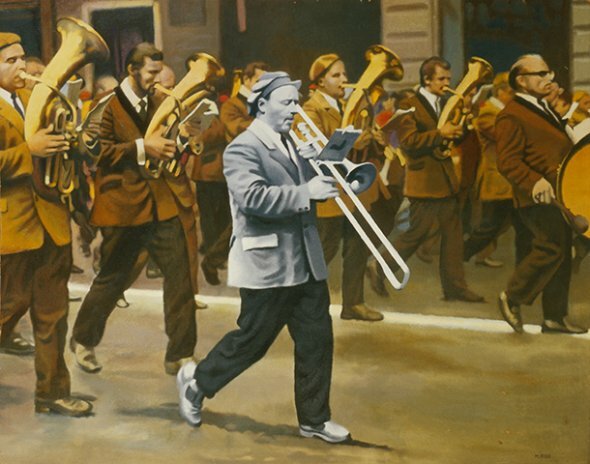 But while the painting Brass Band (1974) did have a figure of a little trumpet player in a peaked cap in the foreground, it bore no resemblance to the proletariat leader. At one of the exhibition’s public discussions, the artists were approached by Estonian art enthusiast Matti Miliuss, who subsequently arranged for the exhibition to be presented at the Deaf Persons’ Society in Tartu and the Tallinn Art Institute in Estonia. The exhibition gained a lot of public attention despite receiving no press coverage. This resonance was connected with the unabashedly photorealist and hyperrealist manner of painting. The exhibited works formally complied with the official line of Soviet art—realism—but in reality they were much closer to contemporary trends in Western art. The professional art scene greeted the young artists with a mixture of genuine admiration and resigned or harsh criticism, but in time Purmale and Polis would come to be regarded as masters of the genre. An interview with M. Polis in May, 2011.